Unsurprisingly, I started by installing the power supply in the basement and routing the necessary cables to the intended places. As you can see, there is a lot of space at the front here, especially since there is no drive cage in front. In addition, you can see how much space still exists between the power supply and the case, which means you can even tuck some cables in front of the unit. According to Fractal Design, you can install up to a 300mm power supply, though I would be surprised if you can even find a unit this long. Of course, you may be more limited if you remove the front area and mount either fans or water cooling components there, though I still think it is unlikely that anyone runs into compatibility issues here. My SilverStone Strider Gold S ST85F-GS 850W is a relatively compact unit, so it looks quite small in this case. I tucked some extra cables in the basement of the power supply. As for routing its cables, I was content with the sufficient number of openings to plug everything in. Between the side, top, and bottom holes, I was able to plug everything in without exposing too much cable. All the rubber grommets were very much appreciated in this regard. 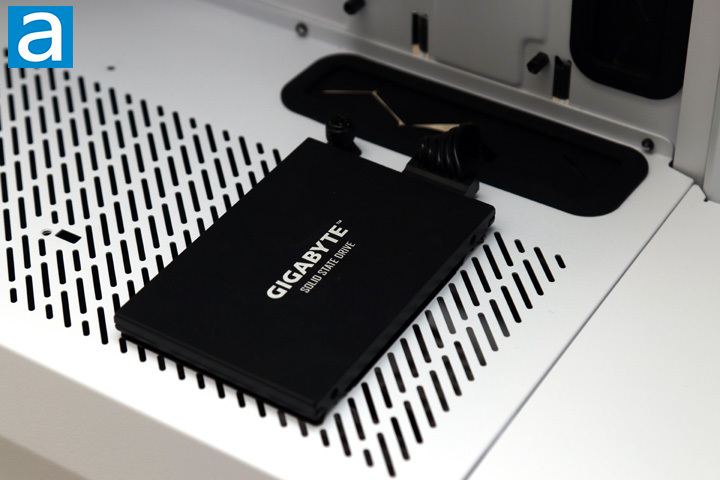 For an mATX motherboard, this looks quite small in a large case like the Fractal Design Define S2. There is a pretty wide gap between here and the routing holes on all sides. Even so, all of the major power and cabling sockets are close to routing holes to make for little to no exposed cables. All the cables routed through the rubber grommets and worked well in terms of spacing. As for compatibility, this case should be fine to fit the major components like CPU coolers and GPUs. According to the manufacturer, Fractal Design has given a maximum height clearance of 185mm and a maximum length of 440mm for the CPU and GPU, respectively. Overall, these numbers should fit most big coolers and GPUs. It should be noted the GPU clearance is given based on the assumption you do install a front fan in front of the card. Thus, the number will be slightly reduced if you install a radiator as well. Overall, I found the internal layout to be good in providing users with ample cabling options for the most part. The many cable tie points and the two Velcro straps all help with routing my cables. In terms of drive options, we have the three drive brackets on the flipside of the Define S2 for 3.5" drives. While I did not install any of these drives, installing drives here is a pretty straightforward task, especially since each bracket has its own captive thumbscrew. I installed a Gigabyte UD PRO 256GB at the front with the metal bracket from the back. I really like this mounting place, but the implementation could be improved. I found the bracket a bit difficult to install, especially since the protruding tabs from the drive sled are a bit shallow. Thus, I ended up spending a bit more time than expected trying to mount these things in position. If you use Fractal Design's Flex VRC-25 vertical GPU riser kit, you may run into clearance issues with placing the drives here. In total, users are provided a maximum of two 2.5" drives in the machine in addition to the cage holding three 3.5" options. I personally think this is more than enough, but for those who want more drive storage, you could look at the Fractal Design Define R6. Overall, the Fractal Design Define S2 was an enjoyable experience to work in. With ample component clearance and more than sufficient space behind the motherboard tray for cabling, I had no issues while installing my build. With my system installed and everything plugged in, I fired up the computer for the first time and everything came to life. 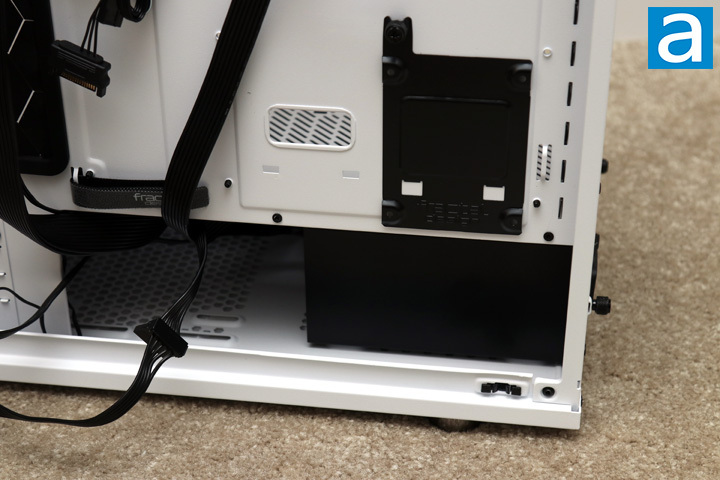 With no tint, you can easily see right into the case and all your components. According to the standard APH Networks sound scale, where 0 is silence and 10 is loud, the Fractal Design Define S2 is a 2.0/10 under full load and a 1.0/10 in more normal situations. Fractal Design has always made excellent fans that can move air and stay silent. 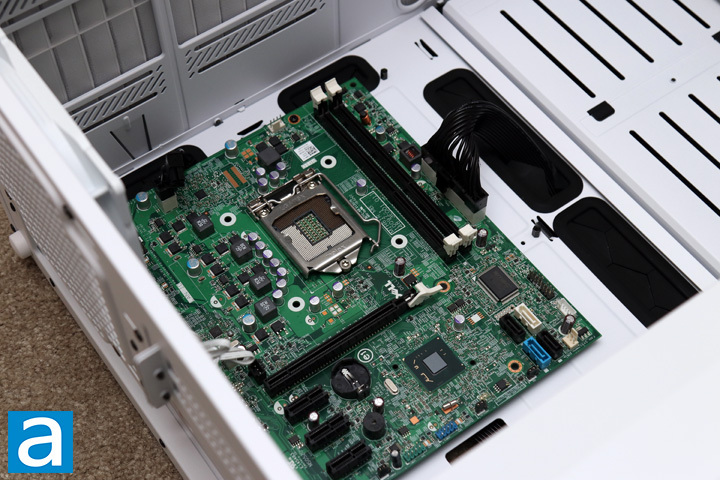 The LLS bearing fans do not create any annoying noises during its operation. In addition, the sound dampening material really works in keeping sound in. You will hear more noise with the ModuVent steel panel off, so keep this in mind. Overall, these fans are very quiet for day to day use. We may have called the Define R6 matchless for silent operation, but I think the Define S2 is just as quiet, if not quieter. I think from the beginning we knew what we were getting into with the Fractal Design Define S2. The intention was to combine the updated Define R6 with the silent and water cooling focus of the Define S. Thus, the Define S2 looks very similar to the R6 with main changes being the front side panel for a more flexible mounting solution with water cooling components. This does mean most of what you saw in the Define R6, you will see here. However, there were some other updates seen throughout. From the beginning, we have a clean design overall with excellent build quality. Everything in this case was clearly made with an attention to detail. This layout is again the same, but now we have large opening for easy airflow for components without compromising on drive storage capabilities out of the box. We still have the impressive third-generation ModuVent and the Nexus+ Smart Hub PWM fan controller. We also have a USB Type-C with USB 3.1 Gen. 2 support, something that was not found on the stock release of the Define R6. The included fans have also been updated with their Dynamic X2 140mm fans that boast a longer lifespan by two and a half times. Installation overall was very smooth. However, I do still have some suggestions for improvement. I personally think the Dynamic X2 fans should be the PWM ones included, even if it was meant to be connected to the PWM fan controller. A lack of RGB LED implementation may be missed by some users, but I personally am fine with this omission. I also think Fractal Design could improve upon the mounting mechanism for 2.5" drives on the power supply shroud. Finally, seeing captive thumbscrews would be a nice to have on the side panels. With all this in mind, the Fractal Design Define S2 is pretty much an open air Define R6. 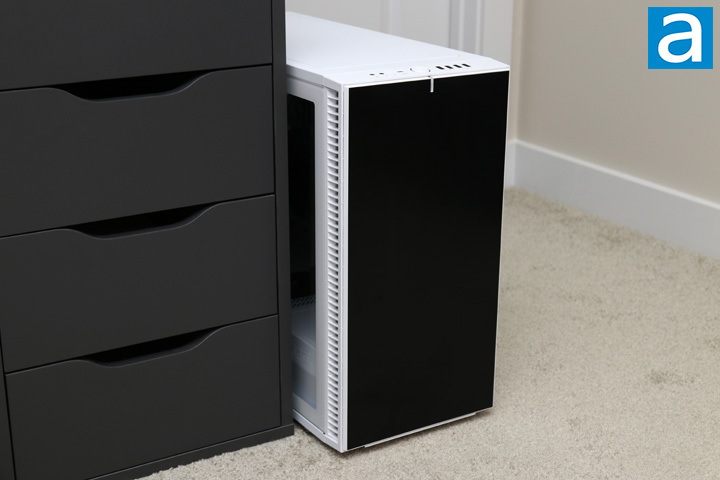 While this may cannibalize Fractal Design's own sales, the Define S2 is still an excellent case on its own. The updated fans and front I/O may even make this case the better option between the two. With all our minor nitpicks aside, the Fractal Design Define S2 can be found for the same price of the Define R6 at $150 USD, but both can also be found on sale for closer to $120 USD. This is a major increase from the original Define S, but it also brings all the premium features from Fractal Design's flagship case, making the price justified. Fractal Design provided this product to APH Networks for the purpose of evaluation. The Define S2 is a flagship water-cooling focused case with all the attention to detail and premium features you should come to expect from Fractal Design. 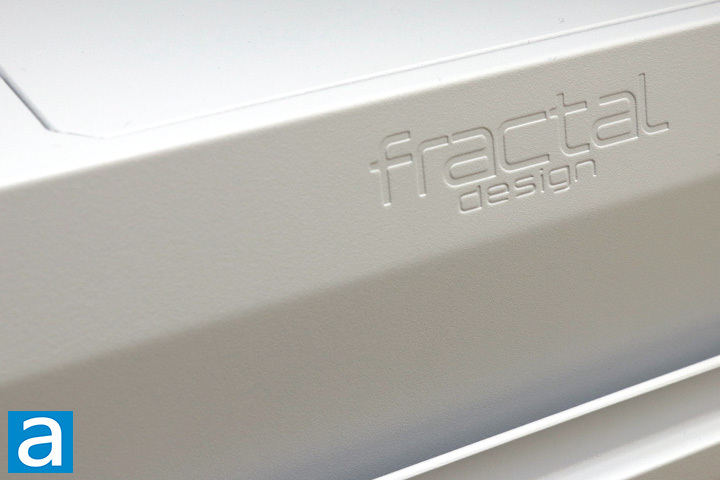 Do you have any comments or questions about the Fractal Design Define S2? Drop by our Forums. Registration is free, and it only takes a minute! posted 3 minutes ago, with 9 posts. posted 5 hours and 57 minutes ago, with 14 posts.